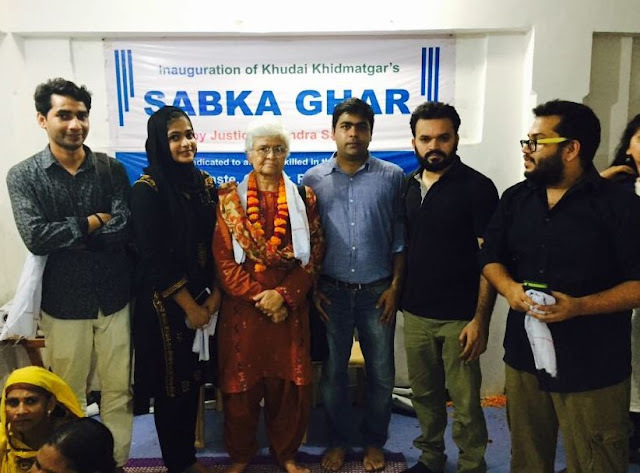 Junaid, a documentary by a group of four student filmmakers from AJK MCRC, Jamia Millia Islamia, Sarah Rifai, Raza Ansari, Mehtab Shah and Daud Arif, was screened at Khudai Khidmatgar, Ghaffar Manzil, Okhla, New Delhi - 110025 on Sunday in front of a big gathering. The screening was followed by a panel discussion presided over by the renowned social activist Kamla Bhasin and Advocate Kabir Dixit (Supreme Court). The screening was organized by the filmmakers in collaboration with Sabka Ghar (house dedicated to all those who have been killed in the name of religion, race, caste, and boundaries). Junaid is an attempt to present the untold story revolving around the lynching of the 16 year old boy who was brutally stabbed to death a day before Eid on board a train while on his way back to his home. A resident of Ballabhgarh, Haryana, Junaid had come to Delhi with his brothers to do shopping for Eid. The boy was lynched by a blood thirsty crowd which falsely suspected him for a beef eater. The film endeavors to bring to light the untold story of Junaid's barbaric lynching that went completely unnoticed amidst the race for TRP's and political mileage. The film opens with the graphic images of Junaid's brother writhing in agony while lying down on a railway platform with his blood stained clothes. The film ends with the archival footage of a pensive looking Ravish Kumar (NDTV) lamenting the loss of an innocent life owing to the disconcerting indifference of the co-passengers. In between the documentary shows a mother talk about her dead son with her tear filled eyes and a teacher talking about the tragic death of his sincere and hardworking pupil. What the film doesn't show but makes the viewer feel is the all pervasive fear and paranoia following the death of Junaid. The film received unanimous applause from all those present. Kamla Bhasin congratulated the young filmmakers for their courage for taking up such a sensitive subject for their very first film. She also talked about the importance of bridging the divide between people divided on the basis of religion, caste, gender, or race. Kabir Dixit applauded the filmmakers for being true to the subject without losing their sense of objectivity. He also stressed upon the need to ask the right questions at all times. The team of filmmakers thanked everybody and discussed the challenges they faced during the filming of Junaid while emphasizing upon the need to show the truth at all costs. Egged on by the positive response, the young filmmakers now plan to take the film across the country, hoping to raise awareness about those unsavory elements of the society that are trying to destroy the social fabric which binds us together.